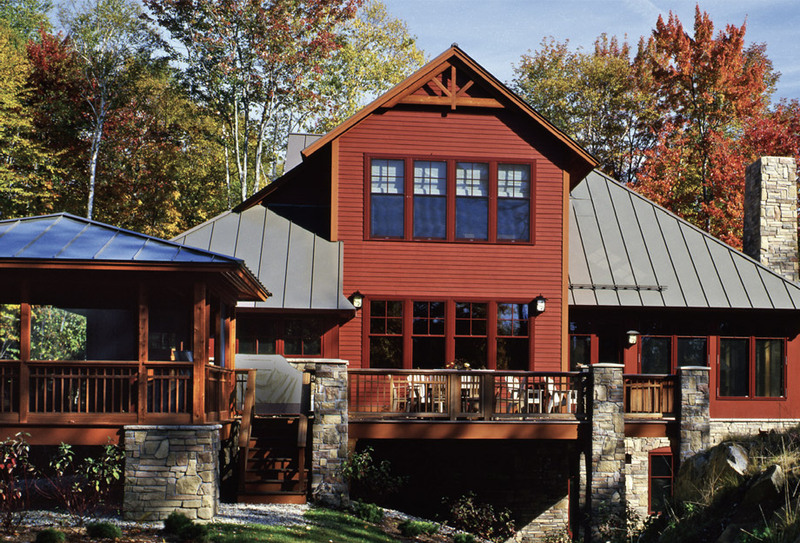 This beautiful 5,000 sf home is located on the mountain top in Chittenden, Vermont. This private residence’s beauty not only boasts a glorious view on the outside, but also includes hand-scraped white oak floors and Douglas Fir beam work on the inside. It comes equipped with all the latest technology; from a dial up radiant and forced hot air heating system, high velocity Air Conditioning, to the complete surround sound stereo system throughout the house. The custom kitchen is complimented with solid surface counter tops and cabinetry straight from Hawk Hill Cabinetry & Custom Woodwork (A Division of Naylor & Breen). The beautiful red oak staircase shown to the right was also crafted by our talented Hawk Hill team, including the the bathroom vanities, custom Douglas Fir ski lockers, the pool room wet bar cabinetry and the mantel in the master bedroom.